Several Moraine pioneers fought in the Civil War, including the John Holderman family who lived just north of here on Caylor Road. 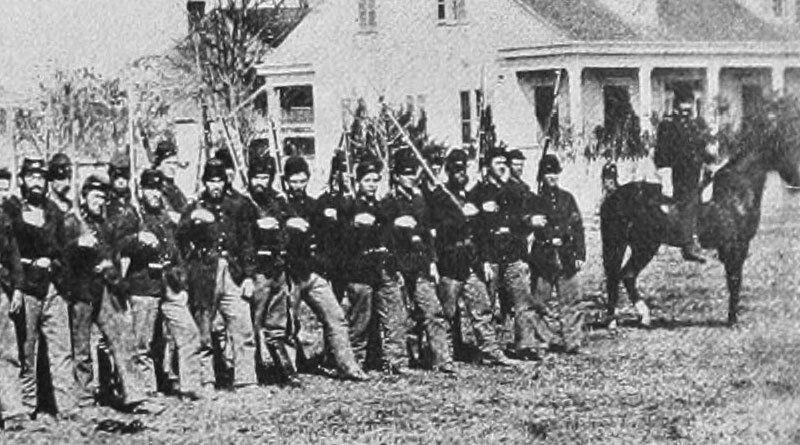 Seven men from the Holderman family joined Ohio regiments for the Union Army. One son, John Jr., was born December 16, 1819 and served the Union in the Civil War as wagon master in the Ohio 69th regiment. After the war he returned to the farm until his death in 1884. Another one of Holderman’s sons, Jacob W., was born December 19, 1840 and enlisted in Company G, the 11th Ohio volunteer infantry in April 1861 under the first call of President Lincoln, for 75,000 troops for three months. After serving the term, Jacob W. reenlisted in the Ohio 69th infantry for three years. He was in the battles of Stone River, Chattanooga, Missionary Ridge and other skirmishes. He was twice captured and was in Liberty Prison for forty days when he was exchanged and rejoined his regiment. He was permanently disabled through sleeping on the ground and lay in a Nashville hospital for over three months until being discharged on disability. Until his death he forever suffered from the effects of his exposures during the war. He spent two years recovering at the Dayton Soldiers Home just north of Moraine. Jacob was married three times and had eight children. He relocated to New Lebanon in 1883 where he was town marshal for two years. Other Civil War road names in Moraine include Union and Infirmary Roads. Antietam, Lookout and Chickamauga Streets are located near the Dayton Veterans Affairs Medical Center. The Historical Marker location is just north of Pinnacle Road near the bike path entrance.